This time we would like to show and explain the street system of Train Fever. The community has asked for a wide range of features and we have now made a selection. Basically, we selected the features which have been requested more often than others and which are most important from a game-play perspective. The pictures above show different old streets (left) and modern streets (right). Streets can have one, two or four lanes with and without streetcar or bus lanes. There are city and rural streets. All types can be arbitrarily combined. 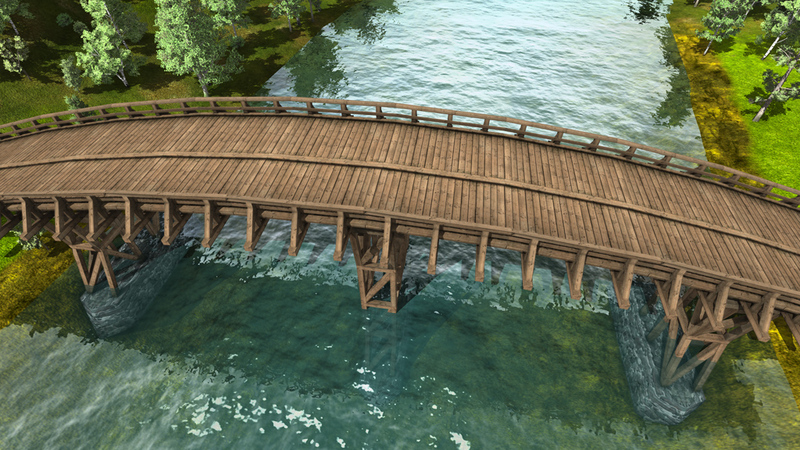 Bridges can be built with wood (left), stone (right) or steel. The construction material limits vehicle speed. 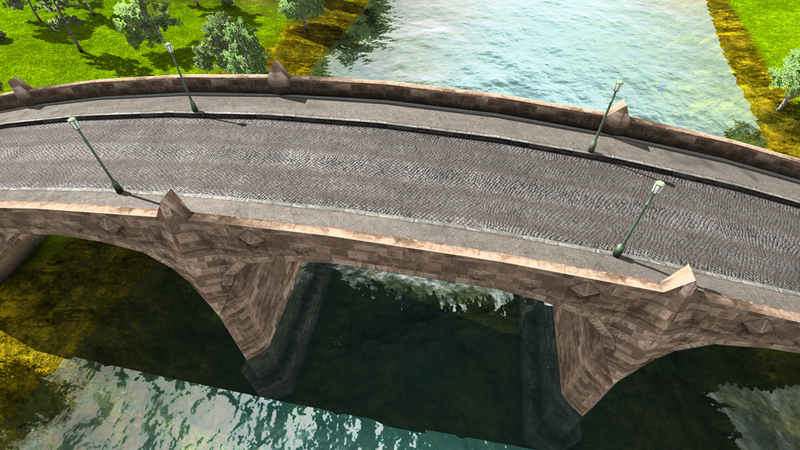 Bridges are built manually by the player, i.e. the player has to choose the type of the bridge, and the start and the end point. There’s no automatic bridge construction (where bridges are automatically constructed everywhere a street has a certain height). We believe this way of construction is more fun and gives more control to the player. The left image shows a rural street bridge overcoming a small valley. The right image shows a modern street crossing with traffic lights, streetcar tracks and bus lanes (red). Streets can be extended with bus lanes or streetcar tracks at any time. Cars are not allowed to drive on bus lanes. 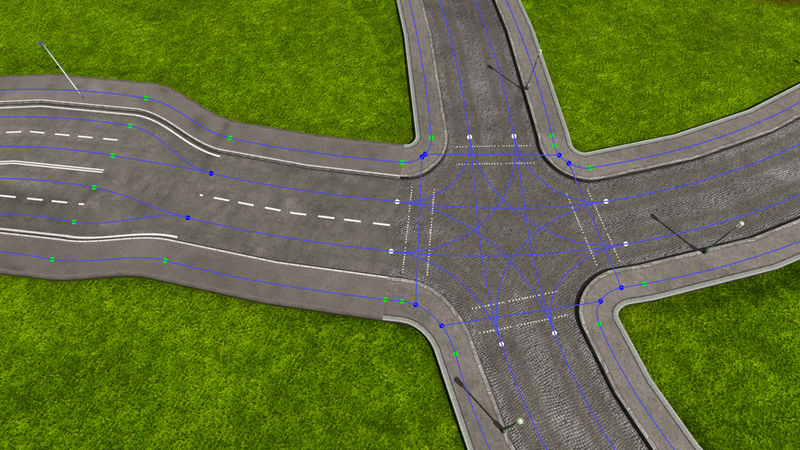 Also, traffic lights can be added to crossing if there is too much traffic. Vehicles and people move on streets and sidewalks. In order to realize this, artificial lanes are created, which are illustrated in blue on the left side. Of course, these lanes are only visible here in order to explain how it works, they will never be visible in the game. The image on the right illustrates bridges on multiple levels. There is no limit for constructions as long as enough space for the bridge pillars is available. You can also see railroad tracks on the right image. This is what we feature in the next update! Thanks for all these pictures! Just miss 6-lanes (or more) streets/avenues and one-way roads! But i’m sure you’re thinking about this! Once again, thanks for your work! I agree, 6 lanes streets would be a good addition, and avenues with be possible to put tram tracks and bus lanes in the median would be even better. Although do I think any more lanes would be unnecessary. Still, wonderful update and screenshots! 1. Tramway catenary – will be it on release? 2. Can we build tramways and stops in the center of the roads (on second (left) lane)? 3. Maybe will be update about tramways? Also, of course, here is russian translate. Will you have an update/downgrade street option kind of like SimCity or have to demolish the whole street like Cities In Motion 2? Looks amazing. The train tracks looks very nice, so perfect. And the textures on the pedestrian passenger, very nice. Keep the info coming! 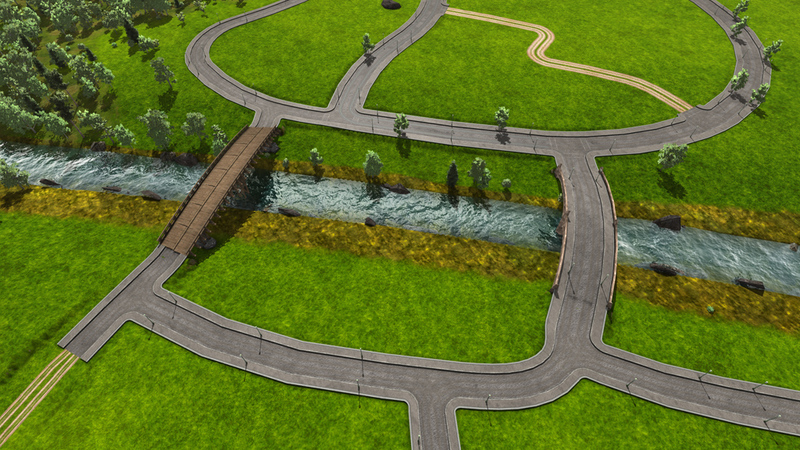 So, because bridges are not automaticly made we could make a road down a valey on one side and one up on the other side? That’s awesome! I just wished you’d show more in-game footage, maybe even some video’s, get the word around, because I think you could get and deserve so much more attention. I hope you guys realise that eventhough your estimated release date Q2 2014 looks far away, it isn’t. Will there be junctions on bridges? So that you can have the junctions before a station completely elevated and over streets? And just the next questions: Junctions in tunnels? Our max lanes per street is 4-lanes. 1. 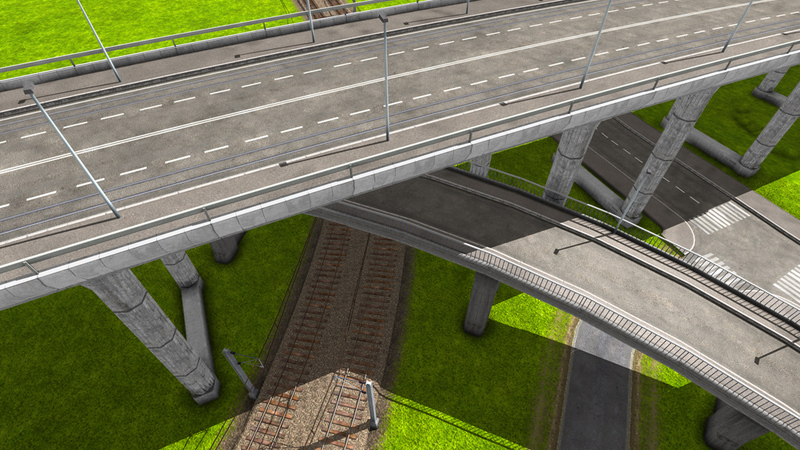 Tramway catenary will be added, these screenshots are from our development version and are not final yet. 2. To keep it simple you’re only able to build tramways on the outer lane. 3. The next update is going to be about railways. An update about tramways is possible later on, when we’ve added more details. And thank you again for the Russian translation! One way streets are in discussion. Every road has its own speedlimit. The large country road comes close to a highway. http://www.train-fever.com/wordpress/wp-content/uploads/2013/11/streets_5.jpg <- Tram rails, catenary will be added later. Some streets can be upgraded, others need to be rebuilt, it depends on the age and the size difference. It's also important, what kind or structures are surrounding the street. A video needs some time to make and currently we're stuck to deep in development to create a video that captures the final game. Near launch we're going to create a video, so subscribe our newsletter to get informed. 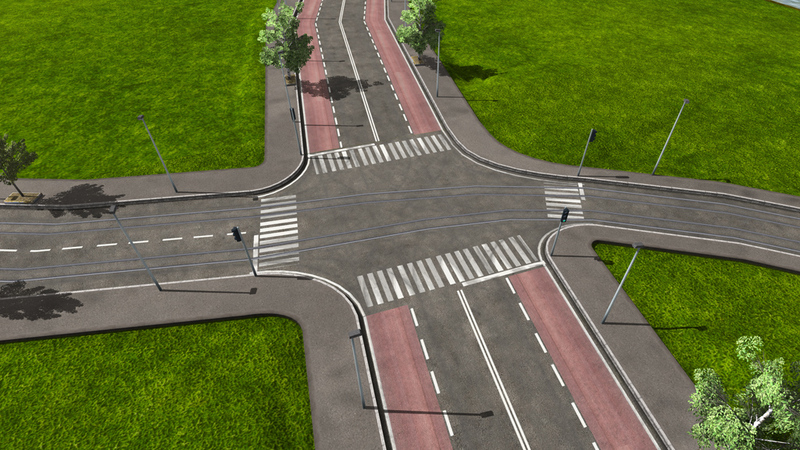 Junctions can only be built on the ground level. You’re too busy to make a video, now that’s what I call hard work! Haha! 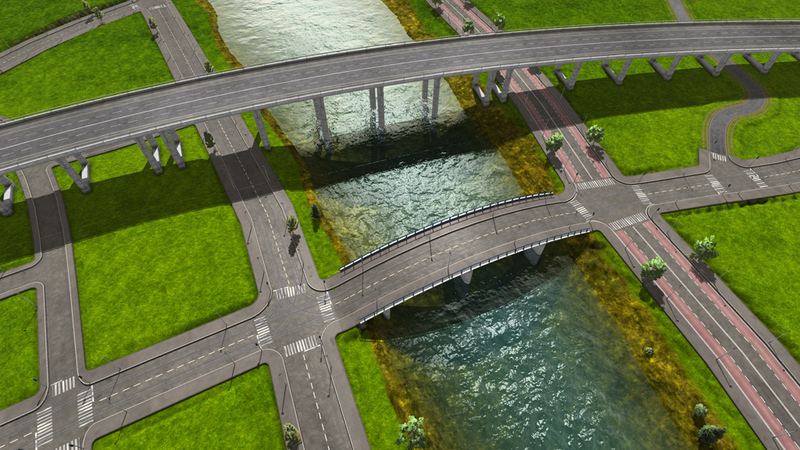 would be nice to have junctions on bridges/viaducts as well, please consider it as well. Otherwise the game looks great, I’m really looking forward to it. Great screenshots, it’s clear the amount of effort and commitment you are putting into the project. I noticed in the game play video you released some time ago, that you can select camera views to follow the vehicles as they travel about. I was wondering if these views would include a first person view so you can, in effect, travel onboard the vehicles? Gratuliere, sieht echt hammermässig aus. Besten Dank für die fortlaufenden Infos und Bilder. mikael, thank you again, great! One more question about trams from our forum: rails will be built in two courses at once (like in CiM1), or we’ll can to build one track? About one way streets – some our users very vote for this. It may be very useful in some cases. Moreover, with one way streets players will be able to build avenues/boulevards, and between this roads build tramways or railway… By the way, tramways be able to build not on road, just on ground? It very useful for dedicated tram line. Generally, if you have time for it – do it please, one way streets (and possibility to build tram tracks on ground) will be very useful for players and for the game, I think. PLEASE, PLEASE, PLEASE . . . design realistic railroad grade crossings accurately corresponding to the proper time era. Crossbucks, wig-wags, flashing lights, swinging gates, dropping gates, all the way up to four-quadrant high-speed rail crossings. Flashing lights, dropping gates . . . I just love watching the animation happen. Locomotion has pretty decent representations relating to the time period. Will it be possible to place bus stops with lay-bys so busses do not constrain cars etc. when stopping to allow passengers to enter and exit the vehicle? Of course this wouldn’t be necessary when using bus lanes, but in the real world not every bus stop is placed at a bus lane. Great update. I know a lot of people ask for a lot of different features, but I very much like that you guys decide on something and then stick with it. “Feature creep”, as another developer I follow calls it (Google “banished game” to learn more) can be a big and time-consuming issue and delay the release of a game for many, many months. So while I applaud your many different options, please do not feel obligated to implement everything all at once. There’s always DLC and free updates for later. Just keep doing what you’re doing and try to stick with your planned release date! Thanks for all the comments. It’s amazing so see that there are many people around who really care about what we do! Let me point out that streets are just one part of the game. Constructing streets is NOT the main task of the player. This said, we believe that the current selection of features is sufficient, but note that we still consider adding more features prior or after the initial release. Vehicles can be followed, and the camera can be very close to the vehicles. However, a first person view (as you may know it from train simulators) is not planned. This would require even more details and higher texture resolutions. Streets with tram / streetcar tracks can be built in one step. When building a street, there are checkboxes whether to add tram or bus lanes to the street. One-way streets is one of the features we consider to add. If we don’t make it, there is still the possibility to add it with a DLC. Tram tracks are built on streets. However, since there are also rural street types (e.g. a field path), this does not mean that it looks like a street. Railroad crossings can be built, but we have no time for implementing all the details you mention. Adding more types of railroad crossings is also possible after the initial release. For sure, trains will NOT pass through street vehicles and people. Initially, we planned to implement bus stops with lay-bys. However, we cancelled it because it was too difficult to solve. The main problem is that there is no space for the lay-bys. The sidewalk is not large enough, and there are buildings at both sides of the street. As you say, it’s still possible to achieve something similar with bus lanes. Also, note that there are bus stations (as you might know from Transport Tycoon), which can be built next to streets. This way, buses can also stop without constraining cars. Thank you very much! It’s very interesting information, I can’t wait for new updates. >>Constructing streets is NOT the main task of the player. As I understand (and as seen in this video http://youtu.be/qwrE8k0NRjo), roads in cities will be built automatically? Just in CiM2 we need to build roads for city grows, because cities build only buildings. Yes, the cities and roads are built automatically, you can additionally add some streets and bridges to optimize the street network. In Train Fever the city doesn’t need those manually built streets to grow. This is amazing function! Thank you again. So you basicly get a city with streets and buildings and you can add a few streets. But how do the cities automaticly grow? Do streets and buildings just pop up or do they need to be constructed by cute in-game workers? It’d be cool if cities would be constructed in a longer period of time by workers (I think construction workers in games are adorable), rather than just rise from a cloud of dust, but I understand that thatd be pretty hard. Wow, I see this game for the first time and I’m pretty sure that I’m gonna buy this. By the way – is there any chance of implementing trolleybuses beside buses? You know, it could make people happier with your service if they see an ecologic vehicles. But I can understand lefting trolleybuses out – it’s a train game after all, not Cities in Motion 2 . Agree with you, I’ll very wait DLC with trolleybuses too! Trolleybuses not only more ecologic than buses, but and more dynamic, reliable and cheap to maintain. Moreover, first bus with ICE (Benz, 1895) appeared later than first trolleybus (Siemens, 1881) and tram (1881, too). While I am also looking forward to a potential trolleybus-DLC, I want to clarify some of your statements. - Trolleybusses are in general not more ecological than diesel busses. While they are more quiet and dont produce local emissions, they do produce emissions at the site of energy production (think coal powerplant). They are also less efficient in raw energy conversion. - They are more dynamic considering acceleration. - They are not necessarily more reliable due to the complex overhead wiring. - The overhead wires and less standardized vehicles also lead to higher maintenance cost over the diesel bus (http://de.wikipedia.org/wiki/Oberleitungsbus#Betriebskosten.2C_Energieverbrauch_und_Rekuperation). Other than that they are of course more attractive and would make a great addition to the game! 1. Well, yes, but buses pollute the air right outside my window. About powerstations – it would be gas power, or hydro power, or atomic power – it more ecologic than diesel on city street. Moreover, electricity is cheaper than fuel. 3. Trolleybuses more reliable than buses, just because trolleybuses has less intricate details. Electric motor is much simpler than a diesel, moreover trolleybuses don’t have transmission: just motor, cardan, differential, wheels. About electrical equipment – before the advent of transistors and thyristors (80′s) it very simple and is repaired with a sledgehammer. 4. Well, about less standardized vehicles – in one network (city) similar models of trolleybuses are generally used, so it quite standardized. About overhead wires: it quite expensive during construction, and, of course, need to maintenance. But as a result maintenance of trolleybuses (vehicles + wires + electricity) is cheaper than maintenance of buses (vehicles + fuel). Generally, cost goes like this: network launch – 1. Bus (cheaper), 2. Trolleybus, 3. Trams; network maintenance – 1. Tram (cheaper), 2. Trolleybus, 3. Bus. Sorry for my bad English, just I live in ex-USSR Minsk, city with the 2nd trolleybus network in the world. Wow, this looks amazing! The railroad tracks too! BTW I wrote an article about curved roads/tracks in theory, but I don’t have experience with putting it into practice. http://www.redblobgames.com/articles/curved-paths/ I’d love to hear what kinds of things you ran into while implementing these. Thanks for posting your article. Very interesting to read, and explained in a simple way! In Train Fever we use both Bézier curves and arcs. Especially for tracks we use arcs. As you explain, for each choice there is a number of advantages and disadvantages. Finding intersections and offsetting curves are the biggest challenges. For intersections of Bézier curves, we use numerical functions which work very well in practice. It would also work with converting the curves in multiple line segments of course. For offsetting Bézier curves, we actually evaluate the center Bézier curve and add the offset afterwards. Thank you — that’s great to hear! That last screenshot alone is enough to sell me this game. 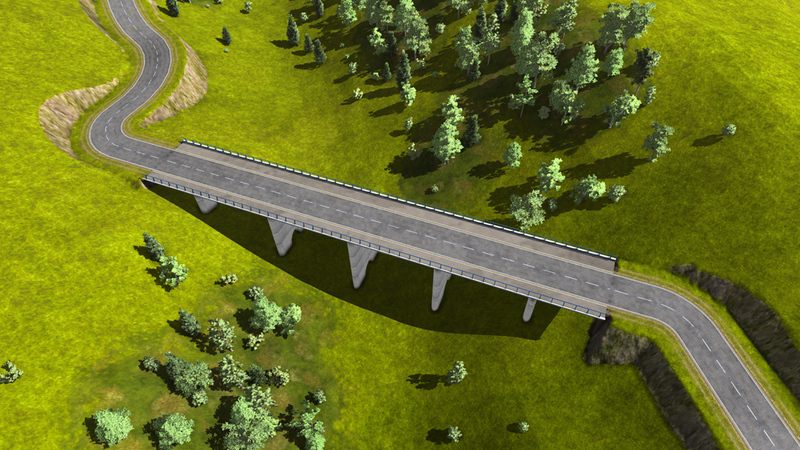 Finally a game that will truly allow me to have multiple levels of roads and rail crossing over/under each other. For me that’s been an issue with every single transport tycoon/simcity style game. I hope the bridges will be capable of allowing us to cross from one high cliff to another with a large valley below, there are limits of course but most games fail to simulate the height and length that real life bridges can cross.